Crowns or partial crowns (onlays) are the treatment of choice when there is insufficient tooth structure remaining to hold a direct filling or when the tooth is broken, worn down or has numerous cracks. A crown is like a cap over the existing tooth structure. When you present for this procedure, the compromised tooth will be carefully reduced to certain dimensions, and impressions will be made of the tooth preparation, and a color match is performed. The patient will leave the office with a temporary crown cemented on the tooth. During the few weeks of wearing the temporary crown, patients are advised to be careful and not chew hard or sticky/chewing foods, candies, gum, etc on that temporary as it is usually made of a brittle material and the cement is not very strong. If the temporary should come off or break, please call us right away. The impressions that were taken of the prepared tooth are sent to a dental laboratory, where a lab technician will fabricate a custom, natural looking crown. 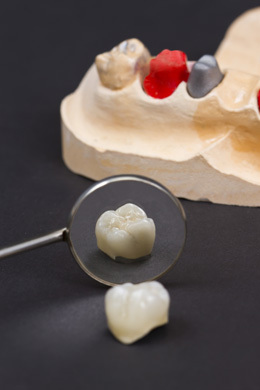 The patient will return to our office to insure the fit and bite are perfect with the new crown in place. We then cement it into the mouth with durable strong cement. With improving technologies, there are various materials that crowns can be made from. Some options include all porcelain, yellow or silver gold, or a combination of the two. We can sometimes even customize your crown so much to include some fun simple design or artwork of your choice! We will discuss these options and what material would be ideal for your mouth to insure longevity and proper function!